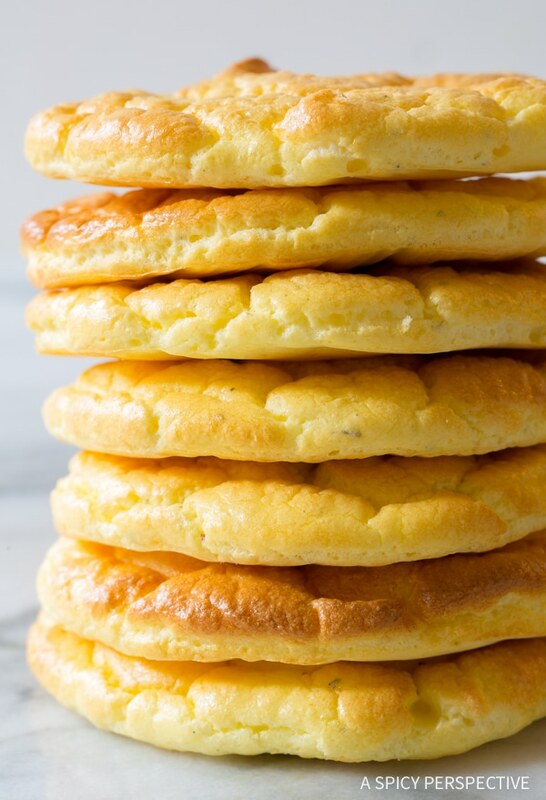 Cloud Bread is delicious, Low Carb, Low Fat, Gluten Free, and Grain Free… The Best Cloud Bread Recipe is a must-make this diet season! Cloud Bread is all the rage right now. It’s a soft airy bread made with only eggs, a little cream cheese (some people use cottage cheese) and cream of tartar. Honestly, other than seasoning, that’s it for this cloud bread recipe! If you’ve been watching your carb intake, chances are you’ve heard of Cloud Bread. Maybe even tried it! Gluten Free, Low Carb, and Grain Free… This Cloud Bread Recipe is the Best Bread to Eat on Any Diet! 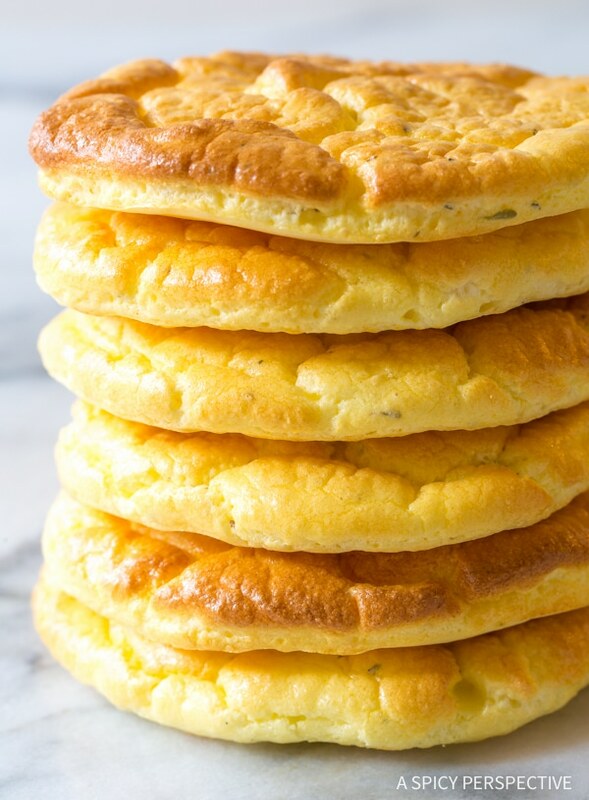 Cloud Bread is high in protein and extremely low in carbs, making it the perfect sandwich bread for those on a low carb, gluten free, or grain free diet. Each “slice” is baked separately and has a soufflé-like texture when it first comes out of the oven. After a couple hours, the texture becomes more bread like, so you won’t even miss traditional wheat bread. Is cloud bread gluten free? Yes! 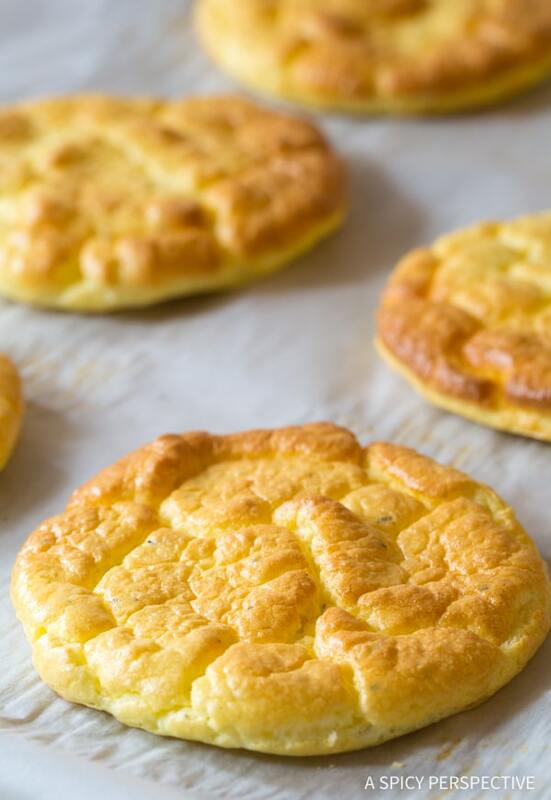 Cloud bread is gluten-free, low carb, and grain free. It’s safe for just about any diet! I’ve been pretty impressed with cloud bread. I wish I knew who invented it, so I could give them credit, and possibly and little bow of respect. I’ve heard it originally came into existence during the Atkins era. However, I believe this is The Best Cloud Bread Recipe because of the seasoning. When cloud bread is unseasoned, or even flavored with sugar and sweet spices as I’ve seen in some recipes, it tastes more like a dessert than bread. 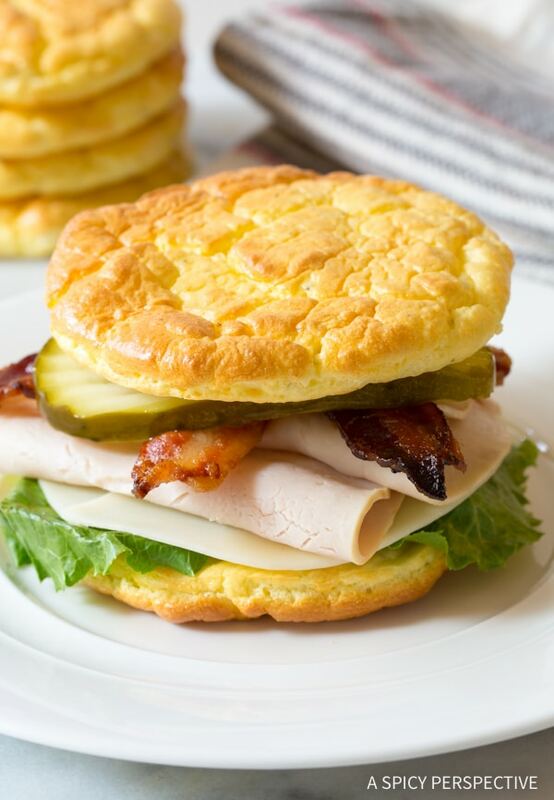 If you are looking for a great low carb sandwich bread, The Best Cloud Bread Recipe in today’s post is the winner. Adding a little sea salt, garlic powder, and dried herbs makes all the difference. When making The Best Cloud Bread Recipe, make sure to whip the egg whites and cream of tartar first. It needs to be extremely firm for the bread to bake successfully. The cream of tartar acts as a stabilizer. Then beat the cream cheese, egg yolks, and seasoning separately. This mixture needs to be perfectly smooth. Fold the two egg mixtures together, spoon the mixture onto baking sheets, and bake. How long do you bake cloud bread? Bake Cloud Bread for 15-18 minutes in a convection oven, or for about 30 minutes in a conventional oven. Do you need to refrigerate cloud bread? Yes, cloud bread should be stored in the refrigerator. After baking, it should last for a few days if stored properly. Try making club sandwiches with The Best Cloud Bread Recipe this week. You’ll be amazed at how easy it is. You’ll also be amazed at how much it tastes and feels like traditional bread. 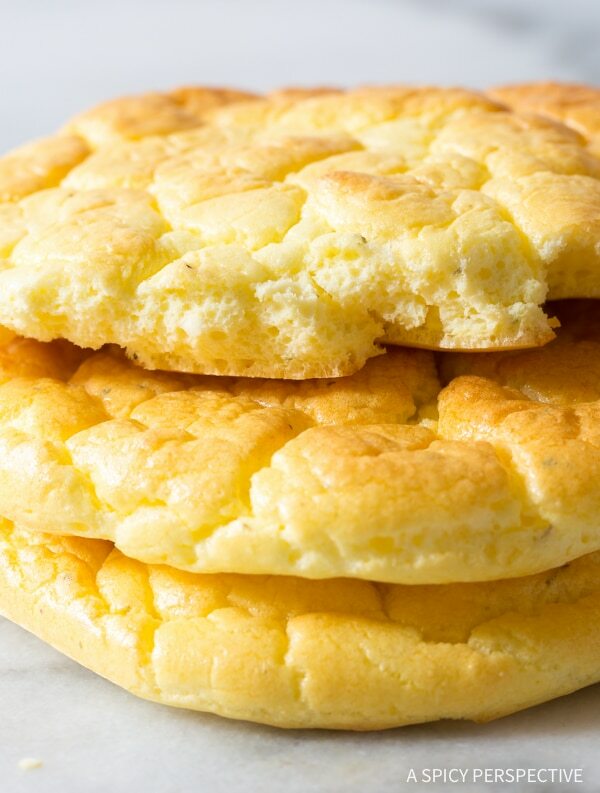 Check the Recipe Card to See How to Make the Best Cloud Bread Recipe! Looking For More Fabulous Low Carb Recipes? 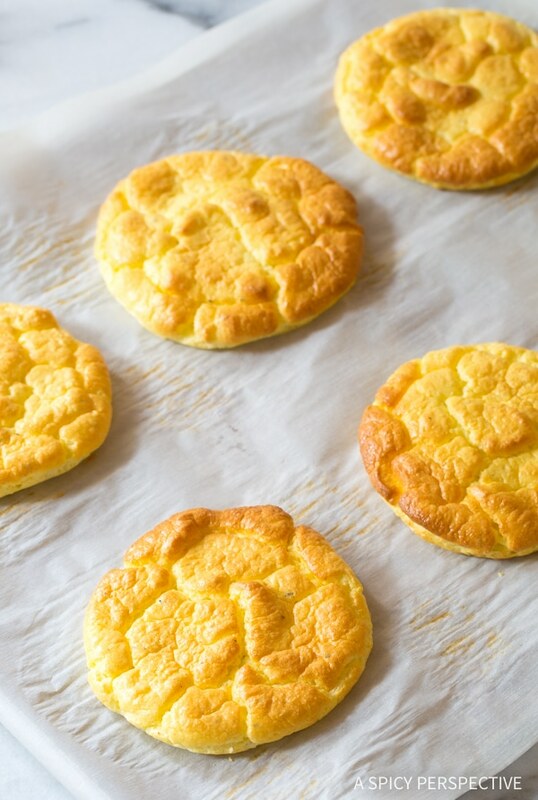 Cloud Bread is delicious, Low Carb, Low Fat, Gluten Free, and Grain Free... 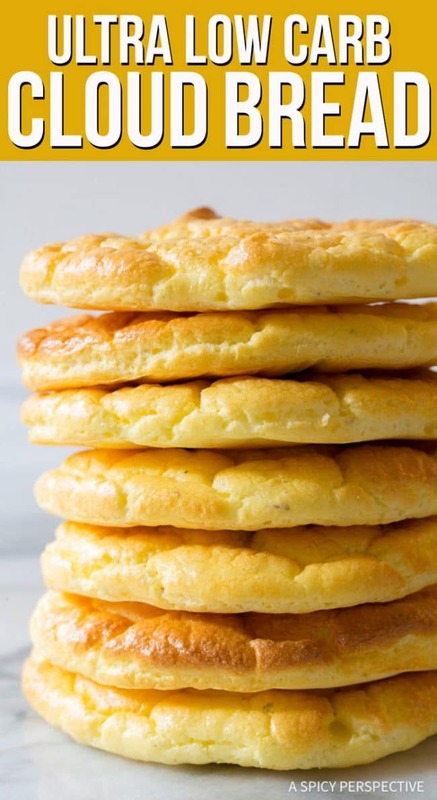 The Best Cloud Bread Recipe is a must-make this diet season! Preheat the oven to 300 degrees F. If you have a convection oven, set on convect. Line two large baking sheets with parchment paper. Separate the egg whites and egg yolks. Place the whites in a stand mixer with a whip attachment. Add the cream of tartar and beat on high until the froth turns into firm meringue peaks. Move to a separate bowl. Place the cream cheese in the empty stand mixing bowl. Beat on high to soften. Then add the egg yolks one at a time to incorporate. Scrape the bowl and beat until the mixture is completely smooth. Then beat in the Italian seasoning, salt, and garlic powder. Gently fold the firm meringue into the yolk mixture. Try to deflate the meringue as little as possible, so the mixture is still firm and foamy. Spoon 1/4 cup portions of the foam onto the baking sheets and spread into even 4-inch circles, 3/4 inch high. Make sure to leave space around each circle. Bake on convect for 15-18 minutes, or in a conventional oven for up to 30 minutes. The bread should be golden on the outside and firm. The center should not jiggle when shaken. Cool for several minutes on the baking sheets, then move and serve! 1) The Best Cloud Bread Recipe can be stored in an airtight container in the refrigerator for several days. However the texture is best if eaten within 12 hours of baking. 2) Go easy on the garlic powder the first time you make it. I like adding 1/2 teaspoon, but that might be a little much for some palates. After looking at many low carb bread recipes, this is the first one I tried. They are YUMMY, especially when eaten with butter! They are very light and soft so I can’t see using them as a burger bun as some have said they do. 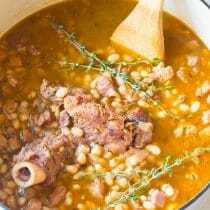 I am looking forward to trying this recipe again with different seasonings or spices. Thank you for posting this recipe! Had my first taste of these divine bread, last night, at WW. Oh my, how delicious !! And only 2 points for the whole recipe !! Sommer, thank you very much! I like this bread! Wonderful combination of ingredients. It look so yummy! Oh I’m totally trying these!! Yum! Can you make this as a loaf? I wouldn’t… It stays in the shape you put it in, for the most part, and doesn’t really rise. So if you filled a loaf pan with it, I’m afraid the outside would be super crispy before the insides were cooked through. Can you use a hand mixer with this recipe? Thank you for this delicious recipe! I followed the directions without changing anything and waaalaaa perfect cloud bread! This was also my first time making it ever. I had tasted it a couple years ago and always had wanted to make it. I think it came out perfect and it is so good! Thank you for this great recipe! I substituted Montreal Steak Seasoning for the salt and Italian herb seasoning since I didn’t have any, and it worked perfectly as a substitute for the bread on the French Onion Soup (though it needed less time under the broiler) and the bread pieces were great on their own. Amazing. I just made a batch. I am not sure what I expected the consistency to be but they are actually a bread like consistency after cooling. I am on Jenny Craig, and my batch made 12 so they were counted at 22 calories each….I am in heaven. My next batch will be with some cinnamon and stevia. Thank you so much for this!! Made the cloud bread yesterday. Just had a bacon, egg and cheese for breakfast . Slightly toasted the bread, came out great!! Sandwich tasted awesome!! This is beyond delicious and so simple to make. Thanks for the great low-carb recipe! Thankyou! This has been the perfect ‘bread’. Comes out exactly like yours – which is rare. My daughter now prefers these for her lunch bread which is great! Just finished making these for the first time. I made them without the seasonings because I wanted to try it plain. I like them but they seem very fragile. I don’t see how they would hold up sandwiching a burger. My first impression is “sponge cake” or “lady fingers”. They did stick to the parchment but came off well with a spatula. I will definitely make them again with the seasonings to make them like garlic bread but again, they seem so fragile I don’t see being able to dip them into sauce or an over easy egg yolk. My eggs and cream cheese were room temp since I did see another recipe that said to let them come to room temp before beating. I did get the whites pretty stiff but not really to peaks so next time I will use the eggs cold. I am wondering if adding a bit of flour would make them more bread like? I use them for burgers all the time. They hold together great! Several people below didn’t get peaks on the egg whites and only had ‘soup’. 1. If you have a cold bowl it helps. 2. It takes several minutes to get the ‘peak’ stage so don’t stop because you give up. 3. If either set of eggs gets too warm, you end up with ‘soup’. I was only able to use 1/2 of my mixture because the bottom of the bowl was just liquid. Although I really like it, there was too much Italian seasoning so i would use maybe 1/2 next time plus look up other seasonings to use. I really like this ‘bread’ better than I thought I would so I will definitely be making it again! I just made these yesterday and am blown away at how good this recipe is! I do have a question though. Today when I took the container out of the fridge and took a piece out, it was very tacky and stuck to my fingers. Is this normal? I stored them in a Tupperware like container. 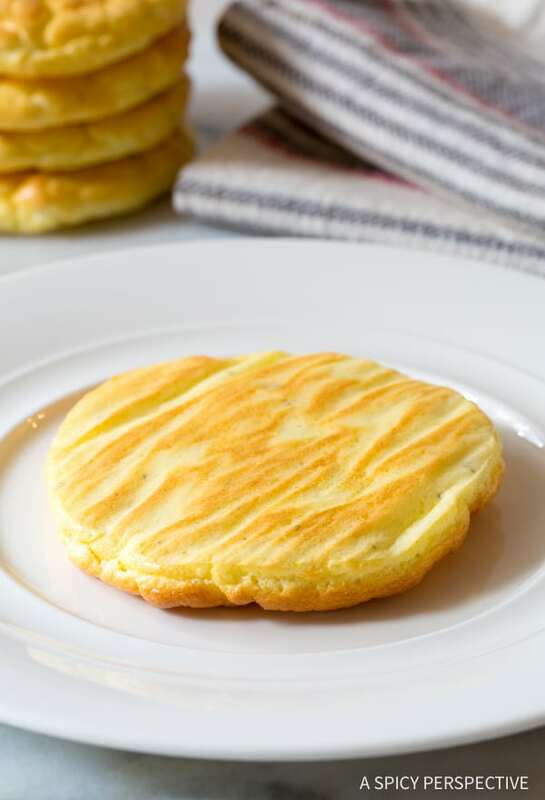 EASY ON THE SALT – I’m doing Weight Watchers and I’m told there are zero points in cloud bread without extra ingredients like cheese, etc. so I jumped on it. Not a bad substitute. I went heavy on the seasoning because I love it, however, I stayed with 1/2 tsp of salt. Wayyyyy too much, and I’m the one who usually adds salt to my food. Unfortunately this batch will have to go but next time I will halve the salt. Also, a tip: the longer I left the batch to cool, the more breadlike it became. I’m not reflecting the salt in the overall rating because it’s changeable and it’s a good recipe and I can think of a dozen things to do with it. Good job! Correcting myself: I just discovered that there are 2 WW points for each piece. Still, pretty good. Can the cloud bread be frozen? Yes. If you lay them out flat on a baking sheet, and flash freeze them. Then you can put them in a freezer bag and they won’t stick together. From one Paula to another, they freeze beautifully. Can this bread be frozen? If so, what is the best way to thaw and/or reheat? Yes, freeze them separately first. Then place them in a freezer bag. That way, they won’t stick together. You can then pull one or two out at a time and thaw them at room temperature. Super recipe! I love them, really feel like you are eating bread :) I made mine a little too salty so next time will adjust. Thank you for such a great treat! I’ve had trouble keeping the mounds on the cookie sheet from running into each other as the cloud bread bakes. So I bought a set of six, small, tart pans. The kind where the bottom lifts away from the sides to remove the tart after baking. I bake the cloud bread in these, and I love it. Each piece is the same size which helps when using two pieces to make a sandwich. 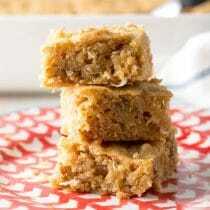 Made these today and while they are absolutely delicious, they are thinner than pictured. If I beat the egg whites longer, will they be thicker? I made this recipe yesterday without the garlic and italian seasoning. Also I used my vegan homemade cream cheese (almond based). This is pretty awesome for buns replacement. The only things I don’t like is that is WAY too salty for me. Plus, the buns are very sticky the day after, perharps it would be a good idea to store in a paper bag..? Mine was store in a tupperware. And also, I would like to have a replacement for cream cheese. What a great recipe! I’ve been eating low carb more lately and good bread recipes are so hard to come by! I read another recipe that replaced the cream cheese with mascarpone cheese. The comments stated that it gave it a more buttery flavor. I haven’t made it yet myself but certainly intend to very soon. Tried this recipe. It was awesome! OMG…I was hesitant on making these at first because I heard they had an egg taste. I am so glad I did because I didn’t taste the egg at all! I split the batch in half; one with the above seasonings, the other half with stevia and vanilla. These taste amazing!!! I was able to making a tasty sandwiches (turkey club, PB & J), a mini pizza, pecan cinnamon roll bread, parmesean bread bites for my artichoke dip, and garlic mozzarella cheese bread!! I made this by putting all the ingredients in my blender and blending well, then pouring onto parchment paper on the cookie sheet and baking. Look and taste the same, to me, as when I separate the eggs and follow the recipe. Saves time, too! Really Dottie? You didn’t beat the whites stiff ? You just put everything in the blender and it worked out well? We are new to cloud bread. I tried this recipe after reading a few. I’m curious if I did something wrong or if this is to be expected. I wasn’t really expecting it to taste like bread, wasn’t sure what I was expecting though. But it turned to powder in my mouth the second it hit my tongue and tasted like very tangy eggs. Is this typical or did I mess something up? Can marscapone cheese be subbed for cream cheese? Sorry, I have never tried that. If you happen to give it a go, please report back! Amazing!! Like many, I held off making cloud bread and picked your method today. Fresh out of the oven! Minutes away from my first, no doubt, incredible sandwich!! I made this and had with bacon and cheese. Loved it and so did my husband. Thank you! I’ve made this bread and it’s so good! Just wondering if you have to use the seasoning? Wanting to make some for my brother-in-law for Thanksgiving. Would they be too plain? I would at least add a little salt. However, we’ve made cloud bread with all sorts of seasoning… Cinnamon is really good! I have been wanting to try cloud bread so I tried this recipe last night and it was absolutely amazing! I’ll never miss having bread ever again and I am very, very happy to now have this recipe! Thanks so much! I’ve shared it with everyone I know! That sandwich looks fantastic and can’t believe that’s not wheat bread. YUM! These look like such incredible fluffy clouds of goodness! I can’t wait to try this recipe. I have also made this with a bit of cinnamon and a touch of Stevia to have with coffee in the morning, replacing cinnamon toast. I live abroad and can’t find cream of tartar. Will it work without it? So has anyone tried to fry the mixture? Lol. It’s summer and I’d love a way out of using the oven Los Angeles midsummer haha I’ve contemplated my new toaster oven but it work take so many more batches than using the oven. Thankfully, fall is right around the corner. Is there a way to make this recipe so it can be done as a loaf of bread? My husband and I are trying to find a recipe that is simple to make a loaf of bread. By the way, these are delicious. Hi I don’t have a stand mixer or hand whisk. Can I either use an food blender to whip it up or do you think I could whisk this myself using a whisk. If using a whisk how long would this take and has anyone else made these without a stand mixer or hand whisk. If you don’t have something that can create a finely whipped meringue, it is a little tricky to make. I have heard of people making meringue in a food processor, but not a standard blender. Hope this helps! I use a regular hand mixer and mine come out perfect. You have to be patient and really put air in to the whites with you mixing technique. I made this twice and I have to say the first time I was unimpressed BUT turns out, it was my fault! I wanted to share in case anyone else made this mistake. I’m not a very experienced baker and I didn’t realize there was a difference between wax paper and parchment paper! (Haha). When I made it with the max paper it was impossible to separate and I found out that wax paper melts! (Oops!). 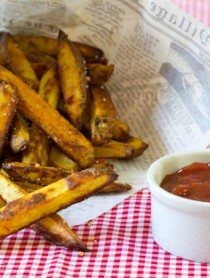 It was absolutely amazing when I used parchment paper! I found that using the eggs and cream cheese and room temp helped. I doubled the recipe and I’m going to try to use it as pizza dough! I also made little circles and after they were completely baked I put butter and cheese on them and through them in the oven for a few mins. Absolutely delicious! Thanks so much for the easy recipe!! I had a craving for bread and these certainly hit the spot!! So easy to make and the taste was absolutely delicious. Will be making these on a regular basis. Not ‘low fat’ cream cheese. It’s full of additives you don’t want to eat, and this recipe was designed to intentionally be high fat. Who else would want to look up / eat this besides a low carb/keto dieter? Plus, one will run into texture issues with low fat cream cheese, because it contains softeners. For two tablespoons, it’s so much better-tasting with full fat brick cream cheese. In the cloud bread recipe it calls for “low fat” cream cheese, isn’t this contradicting what keto is about? I’m just asking because it’s confusing to me. Not a baker at all but found your recipe. I couldnt get my egg whites to peak just a frothy pile, my end “batter” looked like bubbles from a bath. I cooked it anyway abd was shocked to eat this wonderful bread afterwards! Absolutely my favorite keto recipe! Easy even with my “bubble batter”!! I made cheesy garlic bread with it- thank u so much for sharing this awesome recipe. 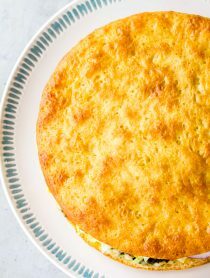 Really helps us non-bakers stay with keto! I’ve been looking at these Cloud Bread recipes for a least a year. This one sounded the most interesting. They turned out great, but I forgot to take a picture! There was not too much garlic but were definitely too salty for me. Will cut back on the salt next time. We were delighted with the texture and ate them with chicken salad. Mine are sticking to the parchment paper. What am I doing wrong? It sounds like you need to whip your meringue a little more firm. Happy Baking! Followed the recipe exactly and they came out perfect!!! Thank you! My Keto diet has been missing something g like this! Just made a batch up. Easy to put together recipe that was fun for this nonbaker. Need to try different cooking times to figure out which is best for my oven though as my first batch came out a little over done. Still tasty though! Will try some different flavors of spices also. Definite make again treat for this keto dieter! Thank you for the Cloud Bread recipe! I recently tried it and have already made it several times. If you haven’t tried making French Toast with it yet, you must. I cannot taste the difference. We use fruit or a homemade fruit compote rather than syrup. We made this bread last night. We used it as a bun for turkey burgers and it’s truly amazing!!! It was better than any bun or bread we have ever used for a burger. Thanks so much for the recipe. What we’re basically making is soufflé. So yes the whites must be whipped to stiff peaks and great care should be taken when folding the whites into the yolk mixture. Some small lumps are okay. I’m thinking of tinkering with this by incorporating some old soufflé recipe ideas. Game changer! This is a great recipe!!! I’m using it as bread and so happy!! It has enough fat content to satiate and keep you going from one meal to the next. Made these today and we LOVE them!! YUM!! Thank you!! :) We are making Eggs Benedict tonight with the cloud bread replacing the English Muffin. I’ve made a few other kinds of keto friendly breads and they were so dense andaome were gritty. This was neither! It’s light and soft. Definitely will be making it again! i have a Yolk allergy, can you advise on what to put in place of the yolk? or can i omit them ? I have not tried omitting the egg yolks. However, I think it would work, but the texture would be more brittle than flexible. Can you make this with a regular hand mixer? I don’t have a stand mixer. I made these and the were good but came out like pancakes? What did I do wrong? Sorry that happened! It sounds like your meringue deflated. It needs to be whipped to very firm peaks in order to hold its shape. After 45 minutes they still weren’t brown. Any ideas? It sounds like the thermostat of your oven is off a bit. This is very common. I would purchase a small oven thermometer to hang off a rack, in order to get a more accurate reading. Just made these with Epicure Rosemary and Garlic seasoning. First time making cloud bread. Turned out really light and fluffy. Thanks for sharing, your instructions were great! You freeze this cloud bread? Can you toast these in a skillet after cooked to make a grilled cheese?! This worked beautifully! I followed directions, and went just a bit easier on the garlic as suggested. I used regular cream cheese rather than low fat as I am following the keto way of eating. The video was helpful to watch as well. If I had one complaint, it may have been a bit on the salty side. It’s hard for me to judge as I rarely add salt lately. Thank you for the recipe and suggestions. I will try making this. Fabulous. My first attempt at cloud bread, made tonight for our hamburgers. My husband and I were not disappointed. I’ve been bread, cracker, wheat and any type of flour product free since 1-23-18, eating a keto lifestyle. I tasted a plain sweet cloud bread last year, a friend made, but this recipe is far superior. Hers tasted very eggy. I used full fat cream cheese, Good Season copy cat seasoning mix for the Italian seasoning and jumbo eggs. My effort resulted in 12 buns. I used parchment paper and a disappointing new, GE convection oven. Thank you for a lifestyle keeper recipe. Hard to enter comments with all the pop ups. Easy to make, absolutely delicious. I’m really confused. This says ketogenic but i thought you use full fat on Keto, this recipe calls for reduced fat cream cheese. You can use full fat cream cheese. I eat Keto and I did. Even so, it doesn’t provide a significant amount of fat. The fact that it is a bread that is so low in carbs is what makes it appealing for me. I was just wondering if it turns out the same if you use full fat cream cheese? Thanks. I am dying to make this but I only have a vitamix!! :( Has anyone tried making a meringue without a hand blender? We recently moved and my mixer was damaged. I actually made these successfully with a whisk. Not the easiest method, but if you have the arm strength, it’s possible. Thank you for this great recipe. However, It’s extremely frustrating that you do not have the ingredients written out and that you have to watch the video to get the list of ingredients. As well you do not start the video off by telling what temperature to preheat the oven to. I used goat cheese…but no spices….there were delicious. Turned out great! I used the Daiya dairy free cream cheese to make it Paleo and it still worked beautifully! So, I just did this. The taste is phenomenal! I did, however have a really hard time with getting the “clouds” to stay put on the baking sheet. they got runny. I ended up spreading the whole thing thinly across the sheet and baking it a little shorter time (20 min). Pizza cutter to divvy it up, and I had a really nice flatbread to sop up some curry! I just beat the whites until peaks formed. I don’t think I did it for long enough. Are they supposed to be super stiff peaks? Any Tips for this newbie? Hi, I’m allergic to dairy and some ingredients in mayo (a commom substitute for cream cheese). I’ve scoured the web and still come back to this. What can I use instead of cream cheese or mayo? Will creamy rice milk work? So I made these yesterday, they came out perfect. This morning I toasted them. Go to a lower setting on your toaster because they brown very quickly. I topped them with a fried organic egg and a little avocado. Scrumpcious! Now I am thinking about making eggs benedict with these. My absolute fav breakfast! Love this recipe, nice savory flavor. I wish I could post a picture, they came out perfect! How do you make them so perfectly round? Are you using a mold of some type? I just made these for the first time, and the recipe was very easy to follow. 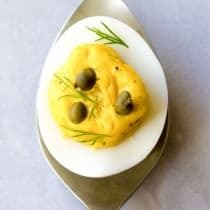 I found that when I folded the egg whites into the egg yolk mixture, the egg yolk mixture would seep down to the bottom of the bowl, and I feared mixing the whites any more. Any recommendations to keep it blended well? These taste eggy on their own, and I would season them differently, but they have a great texture, and lovely presentation. Has anyone tried to toast them 2nd day? Would they crisp up like regular toast? I will try this tomorrow if I can keep my husband from eating all of them. I just tried to make this twice, and the cream or tater and egg yikes weren’t even remotely fluffy. What did I do wrong? It sound like you might have had a little egg yolk drip into your whites when you broke the eggs. The fat from the yolks makes it near impossible to beat whites into stiff meringue. You’ve got to be really careful when you separate the eggs that the yolk are intact. PS – Any remanence of fat in your mixing bowl will do the same thing. Use a dry clean bowl. Good luck! Love this bread, I have made sandwiches or just had a slice with my egg. Yum. But I would like to know how many carbs are in a piece? Worked Perfectly! Other recipes fell flat for me. Most important thing: use eggs at room temp (large size-not XL or Jumbo). I do cream cheese at room temp too.. but not sure if it makes a difference, but I do it anyway. And GENTLY fold in egg yellows with as minimal stirring as you can. I use convection heat, but don’t think it matters. 350F for 16 min for mine, beautiful browned color. Hi these look great I’m gluten free. How long do they keep or can they be frozen to keep them fresh? Love these recipes, just started low carb diet. Yes, I have made these cloud breads ,and they taste very good. My one way of making these is really very easy and not time consuming at all. I stopped eating bread since 2000 and don’t miss it at all ,but these little critters help make my breakfast a lot more filling to help me go longer without eating my next meal. It has helped me begin the IF also. Where is the actual recipe and list of ingredients and amounts? The mixture was too runny to even place on the baking sheet to cook them. Did I maybe not mix something long enough? If you stir in the egg yellows too much it’ll turn liquid. Try to just fold in as gently as you can and stir as little as you can. 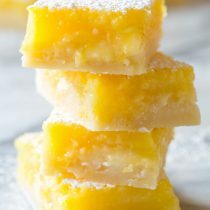 I use a rubber spatula and add 1/3 more yellow egg mixture after each fold in and smear- lol. Also, I use room temp eggs and cream cheese. Mine came out perfectly puffy. Do you gave a non dairy cloud bread? Just made my first batch, amazing!! Flavorful and fluffy, turned out exactly as pictured!! Thank you! It will be fun experimenting with other herbs! So sorry to hear that! The cloud bread does not rise; it stays exactly the same thickness you spread it on the baking sheets. However, it should not shrink flat either. It sounds like your egg whites were not whipped firm enough. Or when you mixed the egg whites with the cream cheese mixture, you over-mixed the ingredients and deflated the batter. I hope you give it another try. It’s really good! cloud bread serving size 10, has to have more than 0.6. maybe 0.6 each piece. Today was my third time making these! I have been eating 2 sandwiches a day! This is definitely my go to (bread)! It is helping me stay in track with my carbs. Thanks for sharing the recipe! If I make a batch of these ahead of time, how long do they last? I can not have any milk products. What can I use instead of cream cheese? That will do as well. In some recipes you can substitute other ingredients for cream of tartar, but I wouldn’t try it here. It’s needed for stabilization. It’s nice to have it on hand for other places you want to reinforce a delicate recipe. I was wondering what the shelf life is on this? I am planning on making a week’s worth at a time. Thanks in advance. Made these tonight. I added sharp cheddar cheese. They were yummy. My first attempt at Cloud Bread since starting my Keto plan and I’m so glad I found your recipe first!!! Very flavorful and easy to make! Thank you! These are delicious!! They make great guilt free breakfast sandwiches. I highly recommend making. Do you have the nutritional values per piece of cloud bread? I am a THM and I just made a batch of these with fresh rosemary! So delicious and easy to make! Thank you for sharing this recipe! Great, easy to make recipe! Thanks! It is so nice to be able to eat a sandwich again! I read that they are better to eat within 12 hours, but I reheated mine in a 400 degree oven for about 3-4 minites and it was even better rhe second day. Yum!!! So many possibilities!!! Question do you think this can be made with the egg whites and egg beaters? Hi Karen! I haven’t tried that, but it should work. However, the consistency might be a bit spongy without the yolks. Hi! I was wondering if anyone struggled with a “soggyish” center? I feel like I baked mine for a longer than reported but the inside still was a tad wet :( Otherwise they taste amazing! I have made a lot of cloud bread recipes, but this one really is “the best!” I left the garlic powder out because I am allergic so that could be why they seemed a touch too salty for me, however they are still delicious with burgers. Thanks for posting this recipe! Just finished making these. Substituted 4 T Greek Yogurt for cheese. 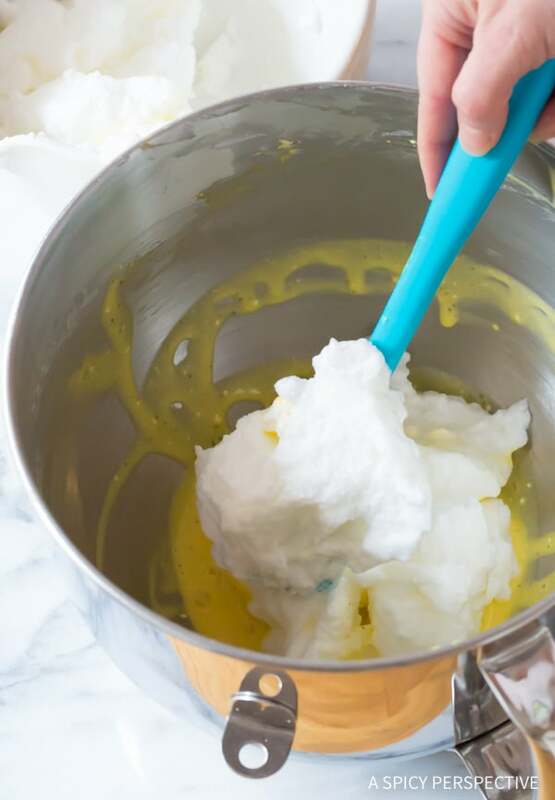 Note that when you start to fold in the egg whites, start with a small amount and work into the egg yolk mixture, then add another third, until done, this will help your mixture stay fluffier. Had to adjust the temp on my small convection/toaster oven down to 275 degrees and turned a quarter every couple minutes to have them brown evenly. Thanks for the great recipe!! I am doing Whole30 and cream cheese is out. Have you ever tried it with coconut cream? I’m wondering if that would work as a substitute? Interesting. Let me know how it works please! I’m going to try this with a cream cheese alternative I found at Publix. I’m also a dairy free person. I’ll let you know how it goes. Can you use this in place of pizza crust? Has anyone used this as mini pizza crusts? I am guessing it would just melt if you attempted to rebake it? I would like to try, but just put them under the broiler, so it was just 2 mins. Yes! They are yummy used this way. What is cream of tartar please. I don’t have that on hand and just wondering if I can use something else instead. Thank you. It’s tartaric acid, a chemical compound found in wine barrels. It’s a white powder and sold in the spice aisle of the grocery store. Its role in this recipe is to stabilize the egg whites so they have more loft. I’ve heard that you can replace it with an equal amount of lemon juice or white vinegar, but with the caution that it may not turn out the same, so do a trial. Another option is to just leave it out and make sure your egg whites are very thoroughly whipped, but don’t go so far that they tighten up and get weepy. Would ricotta cheese work instead of the cream cheese. Or yogurt cheese? Mine are never that fluffy! I even beat the egg whites twice as long. Any tips? It is possible to overbeat egg whites and then they weep. It’s important to get them to the stiff peaks but not beat too long. Also, when adding the egg whites to the yolk mix, first fold in about a third of the whites to sorta get the mixture lightened up and ready for the remaining whites. Then fold in the rest of the whites. Hopefully this helps! Is there a way to store this bread? Does it freeze well? No, unfortunately I don’t believe it would hold its shape. Maybe you could fudge it with raw cottage cheese? I dont have a stand mixer. Will a hand mixer work? Have you tried a hand blender with whisk attached? I made a bread the other day that called for the whites to be separated and whipped, even with the hand blender it took 10 minutes for soft peaks. Oh.. P.S.. … She called them Oopsie Rolls. She had been trying to come up with another recipe and made mistakes and these were the result of her oopsie moment. I had seen that about 5 years ago, I think! I recall back in the early days of my low carbing (almost 2 decades ago) Cleochatra (username) came up with this recipe. Although, she used to say don’t get the yolk and cheese mixture totally smooth. A few yrs back she was still writing low carb articles and recipes for Examiner…don’t know if she still is. This ‘bread’ is also very good as toast. Your eggs must be room temperature for whipping. That is how they whip up to a larger volume. I made these (as per the recipe) and they tasted great but were pretty flat ? What did I do wrong?? 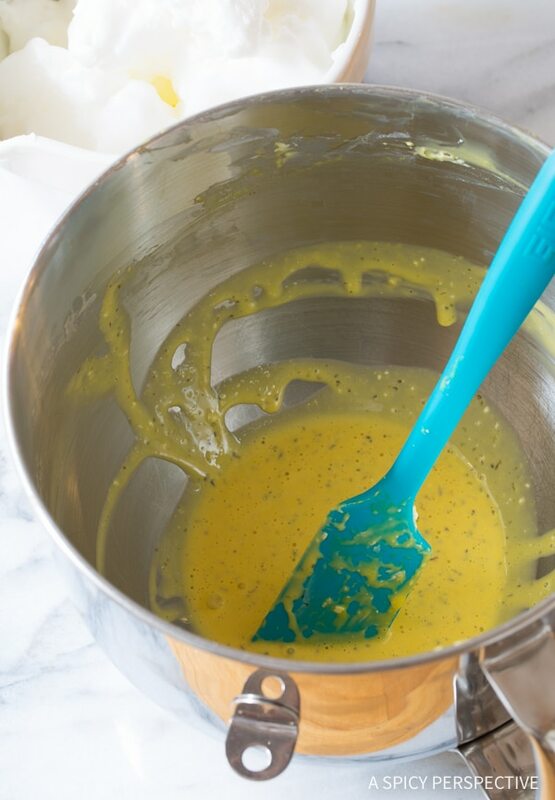 Was your mixer still foamy when you placed it on the baking sheets? You might have over mixed it. Another thought is the cloud bread pieces stay about the same size and height as you spread them on the baking sheets. Maybe you spread them too thin? I think the same thing happened to me. Tasty but thinned out. They had similar color to your recipe photos but they were thin and mishapen. Any ideas how long it takes to get the right whipped consistency when using an electric hand mixer? I spent about 15 mins and it didn’t seem fluffy enough. Store them in a zip bag and either place in the refrigerator for up to 3 days, or you can freeze them. However they taste best fresh. Very interesting, I’ve seen this before but never looked into what it actually is. Sounds like a great idea! I’ve seen this so much but never made it. I think you’ve given me a reason to finally give it a go! Just wondering how many calories if made exactly as your recipe. Thank you. We don’t usually provide nutritional facts, because so many of the tools available vary greatly in their calculations. However, according to the My Fitness Pal app, two slices contains: 3g fat grams, 38 calories, 1g carbs, and 2g protein. According to the chart on P. 2 it’s 38 calories per slice. You might want to go back and update that chart. It actually states that the recipe yields 10 pieces and serving size is 10 pieces. I so need to try cloud bread! Hmmm . . . I need to try this! I’m liking the looks of it! I’ve been meaning to make this for the longest time. Looks perfect! Making for the first time and my batter did nit firm up. Can you tell me why? I followed the recipe! It sounds like your whipped eggs whites weren’t firm enough before you folded them in with the yolk mixture. You need an extremely firm meringue, in order for it to hold its shape. Just wondering, do you think you can use no fat cream cheese in this recipe? Or even the part yogurt blend cream cheese that is offered at my local grocery store? Can you use cottage cheese? or yogurt?